When first brought to Europe it was cultivated in Grasse for use in perfumery, now it is mainly cultivated in Morocco, China, South Africa, France, Comoros Islands and India. The clusters of flowers grow on a 50 cm high stalk. This is a night-blooming flower which is harvested early in the morning when the buds are closed. The flower gives off its scent over a long time, when cut and put in a room they will scent the entire room. The best way to extract the scent is by enfleurage which is the most time-consuming way of extraction but gives the truest scent. Another, more commonly used method is solvent extraction which gives an absolute. It takes 1 200 kg of flower buds to get 200 grams of absolute, making tuberose one of the most expensive scents. 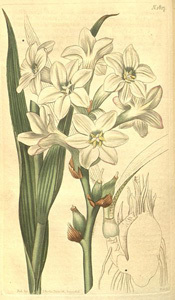 The scent of Tuberose is extremely complex and changes over time; a cut flower will change its scent from sweetly floral with slight campherous notes to earthy and musky notes as the flower matures and finally the scent turns to rot and bloody meat as the flower turns brown and dies. This dramatic change, thankfully, does not happen with the absolute 🙂 The absolute has a strong heady, sweet floral scent with a musky undertone. It is deeply sensual, relaxing, narcotic and exciting. The scent is considered to enhance emotional strength and depth by centering the mind, bringing peace and serenity. Its exciting and sensual properties makes it an aphrodisiac. 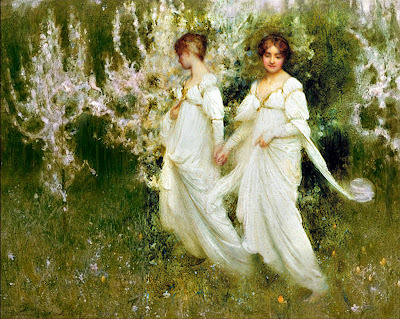 During the renaissance, young unmarried women were forbidden to walk in the gardens of tuberose as it was believed that the scent of the flowers would arouse their passions and give them instant orgasms. 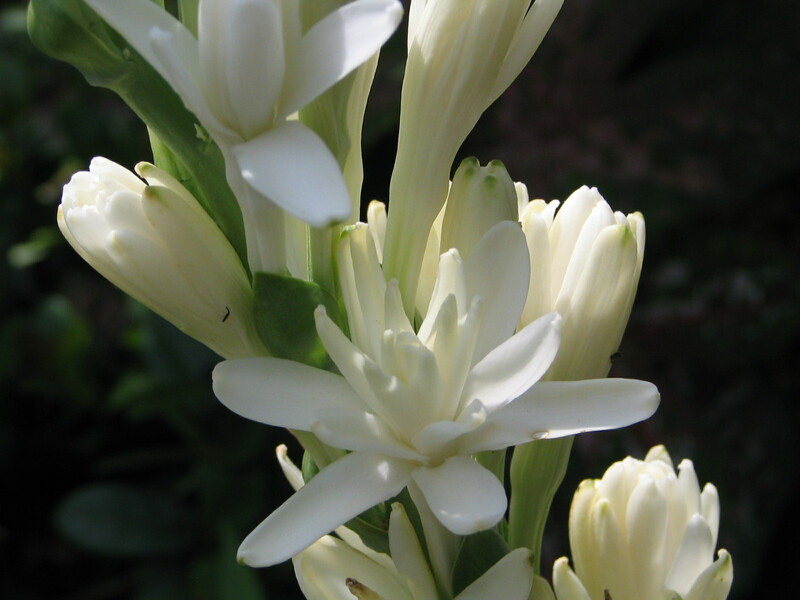 Women put tuberose flowers under their skirts to attract and seduce men.